Mercury, God of Speed and Commerce. Prometheus, the Titan who brought fire to mankind. “Sound” and his soundwaves at 30 Rock. The Titan Atlas punished to support the heavens for all time. Wisdom personified at 30 Rock. One of the newest artworks “Rhythms of Infinity” 2000. 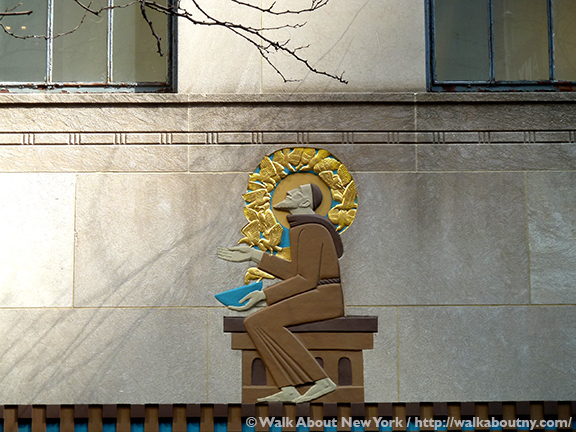 St. Francis of Assisi, Patron Saint of Italy. “Time” a ceiling mural on canvas at 30 Rock. 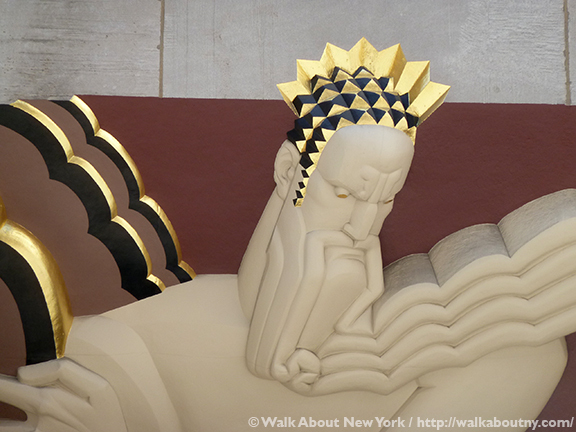 There is more to the art at Rockefeller Center than Prometheus, the Greek Titan who floats above the wintery ice skating rink and just below the annual Christmas tree. Rockefeller Center was one of the last major construction developments in America whose aim it was to integrate art with the buildings and streetscapes for the public’s enjoyment and education. 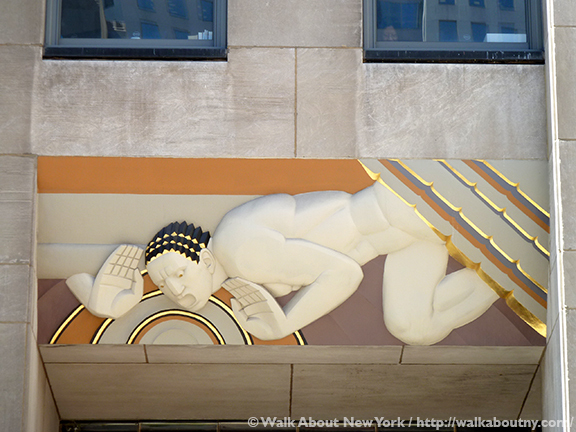 From sculptures to mosaics to murals on canvas Rockefeller Center bursts with a remarkable collection of artwork, most of it in the Art Deco style. 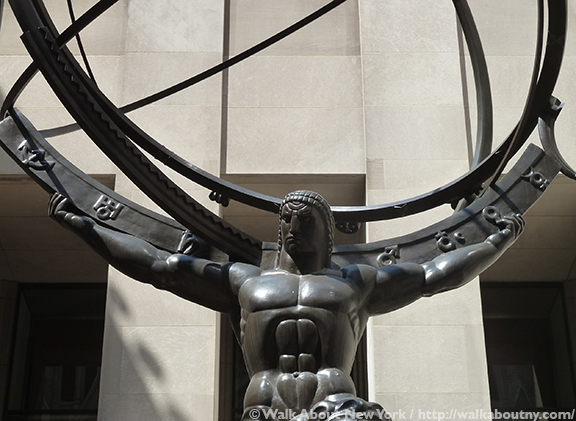 All of it is meant to support the vision of the Center’s founder and namesake, John D. Rockefeller, Jr. Man’s achievements of the spirit, in science, and in industry are stressed, mainly in allegorical ways. Learn about the Center’s famous and not-so famous artworks and how they emphasize the importance of education, wisdom, and international trade. 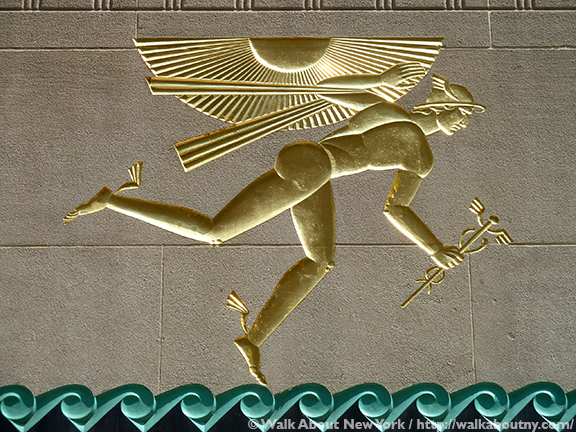 Be a part of this fascinating Tour that takes a look at the extraordinary art—both outside and inside Rockefeller Center—and the rich history behind it. 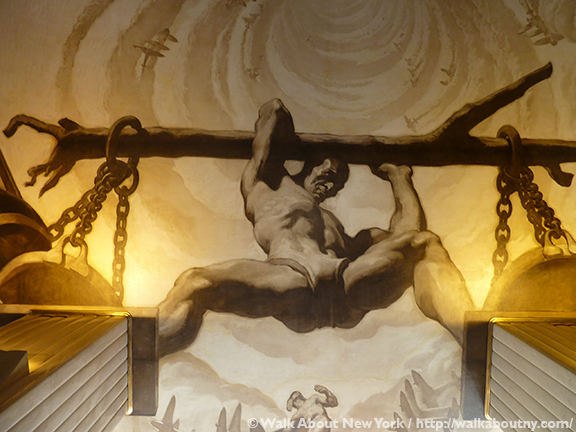 Learn about the men and women who created a breathtaking, unified artistic scheme within the landmarked centerpiece of New York’s Midtown. For more than 80 years the art of this cultural center has enriched and entertained locals and visitors from around the world. John D. Rockefeller Jr.’s determined vision is reflected in all of the great works of art and architecture that make up the Center today. You will be guided around the Center’s significant buildings, its corridors, gardens and inside lobbies. After you take this Tour you will never look at Rockefeller Center as only a collection of buildings, or just a place for a Christmas tree! The Tour’s cost is $30 for adults, $20 for seniors 65 years and older, and $15 for youths 13 to 18 years of age. Please consult the Calendar Schedule for the dates and times of the Tour. Click on the “Book Now” button at the top of the page or below to book your place. The Tour runs 2.5 hours. Bookings must be made at least 36 hours before the Tour begins. We meet outside on the steps of St. Patrick’s Cathedral. 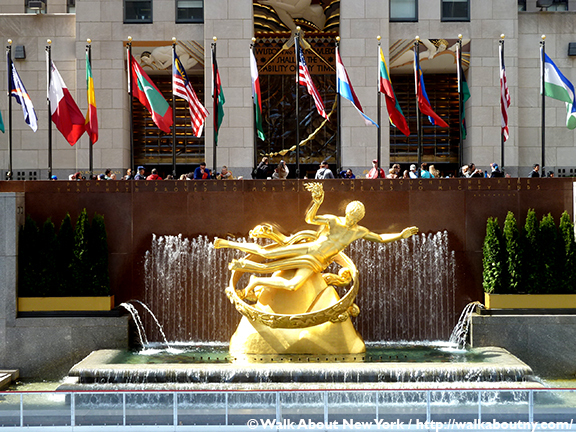 The Tour ends on the plaza between #1 and #10 Rockefeller Center. It is strongly suggested that you travel light. We are on our feet for the entire time. Heavy backpacks and shopping bags can only distract from your enjoyment of the Tour. The terrain of this walking tour is level. You will get a good walking workout on this Tour! It is advisable to wear comfortable shoes. All sales are final. 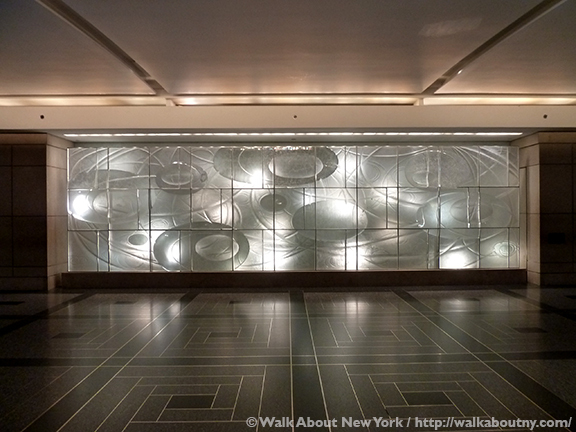 The Rockefeller Center Art Walking Tour will take place rain or shine. All tours are conducted in English. All Tour participants assume normal liability for their behavior during the Tour. Don’t see this Tour when you want to book it? Contact us by e-mail; we will try to arrange a date that is good for you.